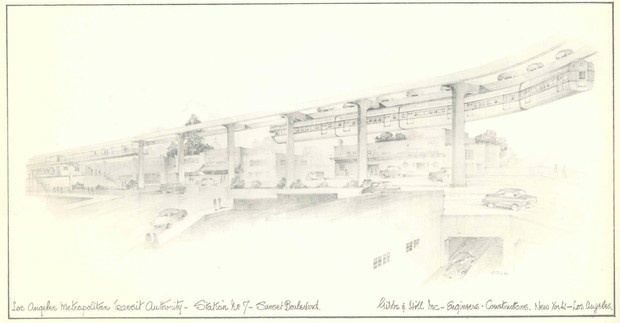 What would LA look like if 100 year-old transit dreams came true? A podcast that informs and inspires the people who are creating the cities of the future, produced with CityLab. 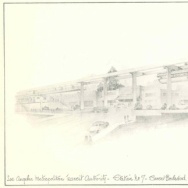 A proposed mass transit route in 1960 included 51 miles of monorail, some of it above Wilshire Boulevard. In the not too distant future, Angelenos could be riding around in self-driving cars in Westwood, walking on rubber sidewalks that don't get wrecked by roots, and taking high-speed trains up and down California. That future is the subject of a new episode of CityCast, a new podcast from KPCC and CityLab (available on iTunes, Stitcher and RSS). Many more people will also take mass transit, or at least have the option to, as Metro expands its subway to the westside. But it turns out the subway expansion is not as futuristic as you might think; Efforts to build a "subway to the sea" have been drawn f0r at least half a century, which leads to the question: How would our city be different if mass transit plans drawn up decades ago were built instead of gathering dust on the shelf? The transportation futures of these cities will largely be defined by whether these new efforts pan out or fall flat. Before elected officials and transportation authorities in these cities look too far ahead, they might be wise to glance back. During the past 50 years, citizens in Houston, Atlanta, and Los Angeles rejected transit plans only to see elements of those same plans re-emerge in today's growing systems. By delaying the development of mass transit within their most densely populated corridors, in some cases for decades, all three cities missed opportunities to expand mobility, contributing to many of the problems they face today. 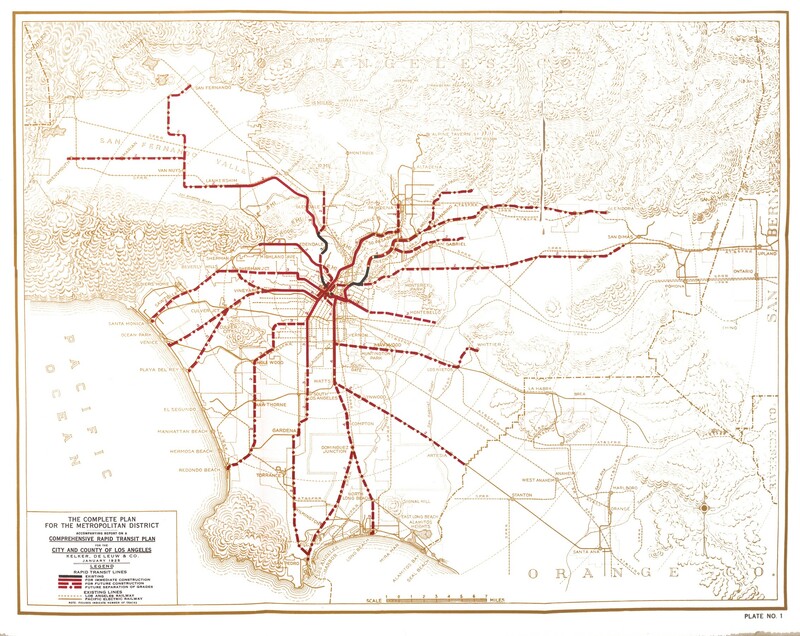 Shelton included maps from Metro, which features transit maps going all the way back to the Pacific Electric and Los Angeles Railway in 1906. That actually got built, but many subsequent transit lines never made it off the page, including a 1925 proposal shown below designed to accommodate a city of three million residents that included a "subway to the sea" – to the beach in Santa Monica – almost a century ago. "The plan recommended for immediate construction of 153 miles of subway, elevated rail, and street railways at a projected cost of $133,385,00," according to Metro. "Strong opposition by the business community to planned sections of elevated rail, as well as voter reluctance to tax themselves to benefit the privately held Pacific Electric Railway and Los Angeles Railway effectively shelved the plan." A 1968 transit master plan, projected to cost $2.5 billion, looked even more similar to what L.A. has today. "Today, L.A. has just over 90 miles of operating rail lines—both subway and light rail—and another 42 miles of BRT lines," Shelton writes on CityLab. "The majority of these lines appeared on the first rail map nearly forty years ago. The blue (south to Long Beach), the purple (west to Wilshire), and red lines (north to Hollywood) appear within nearly the exact corridors as earlier plans, and the orange and silver line BRTs serve corridors highlighted in the initial rail plan. 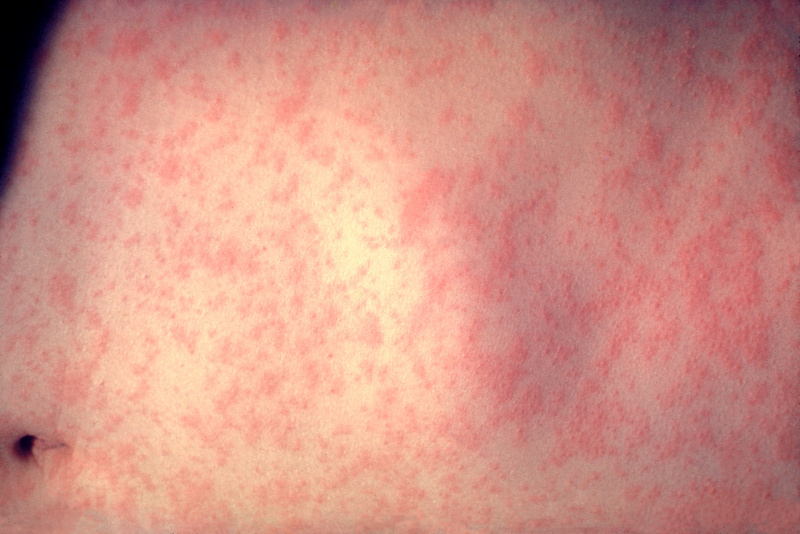 Future expansions are already funded by Proposition R, which passed in 2008. While the city still faces massive traffic problems on its freeways, the system L.A. has and will continue to develop allows the region to move forward with a full complement of options—albeit decades after that process might have begun." CityLab's series "The Future of Transportation"
Enjoy CityLab? Try KPCC’s other programs. Weekdays 9 to 10 a.m.
Dodgers mourn defeat, the benefits of exercise in a pill, is Dia de los muertos too commercialized now?